London (AFP) - Bournemouth moved another step closer to a dream promotion to the Premier League as the Championship leaders sealed a 2-0 win against Brighton on Friday. 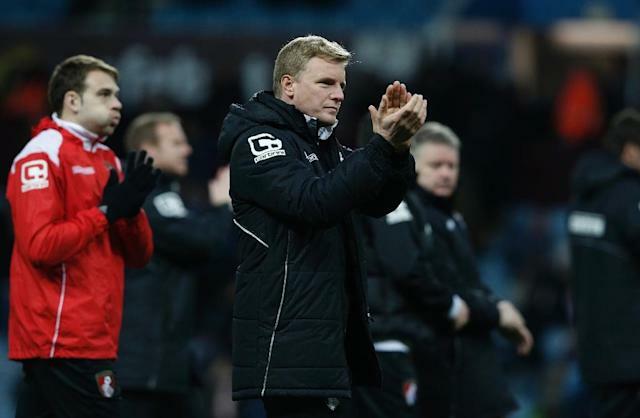 Eddie Howe's team moved four points clear of second placed Norwich after second half goals from Yann Kermorgant and Callum Wilson settled the south-coast derby at the Amex Stadium. Kermorgant hit a fine free-kick to put the Cherries ahead in the 70th minute before Wilson's composed finish gave the visitors their sixth victory from their last nine games. With just four games to play, Bournemouth, who have never played in the top-flight, have their promotion fate in their own hands, although Norwich, Watford and Middlesbrough can all keep up the pressure on the surprise promotion contenders with wins on Saturday. A third consecutive defeat means Brighton, who sit nine points above the relegation zone, are not quite safe yet. Wigan's new manager Gary Caldwell saw his side keep their slender hopes of avoiding relegation alive as they twice came from behind to draw 2-2 at fellow strugglers Fulham. Caldwell, who replaced the sacked Malky Mackay earlier this week, has inherited a team stuck in the bottom three and the former Wigan defender must have feared the worst when his team conceded after just four minutes at Craven Cottage thanks to Ross McCormack's strike. But Jermaine Pennant's free-kick hauled Wigan level and, although a stunning long-range effort from Matt Smith put Fulham back in front, Jason Pearce's second-half effort earned the Latics a point. It lifted them above Millwall on goal difference but things still look bleak for the 2013 FA Cup winners, who are seven points from safety with only four matches remaining.